We thought a lot about energy use for The Thoughtful house from early on for a couple of reasons. The first is that the clean energy industry and its subset of energy efficiency are among the industries that our multi-media company, Rouviere Media, services. We have written about and photographed the environment and clean energy for decades and are deeply committed to the cause of mainstreaming energy efficiency and clean energy. We also had a strong personal incentive to cut down on the high utility costs of the past two homes we occupied, one in North Carolina and a rented one in Utah. At the same time, some energy efficient strategies carry with them a significantly higher cost, and our building budget was that of an ordinary middle class household. To fit the house into our budget, we had to make some choices and compromises, some of which were not our first preferences. Welcome to the real world. We discovered that trying to achieve high energy efficiency is complex and takes a great deal of research and weighing alternatives. In the current homebuilding climate, this level of attention is not always possible for every component in a house. 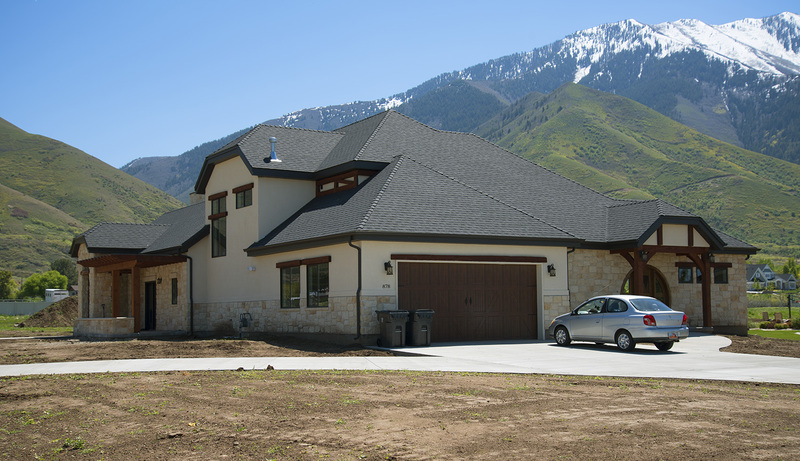 Utah, where The Thoughtful House is located, is experiencing a building boom with a critical shortage of skilled construction labor. Contractors and subcontractors are moving quickly from job to job and don’t always have the time to consider with the average home owner all of the possible alternatives for energy efficiency. Partly for this reason, we chose to go with a building contractor who primarily does commercial work but also does residential building on the side. Our builder, Kelly Adams of A2Z Construction, is accustomed to building energy efficient commercial buildings and was able to put together a reasonably energy efficient package for the price we could afford. It also may allow us to add some components such as solar panels in the future to further reduce electrical costs. Site and design the house to take advantage of passive solar features. Install an energy efficient furnace and air conditioning unit. Upfront, we added to that list the strategy of joining with our adult daughter to build a single larger house rather than each of us building smaller separate ones. Larger houses are not generally considered energy efficient, but in comparison to building two smaller houses, one larger house enabled us to achieve both significant energy and financial savings. This approach gave us the combined financial resources to afford an ideal building lot on which to site the house using passive solar principles. It also allowed us to install a better heating and cooling system that was less costly than having to install separate systems for two houses. 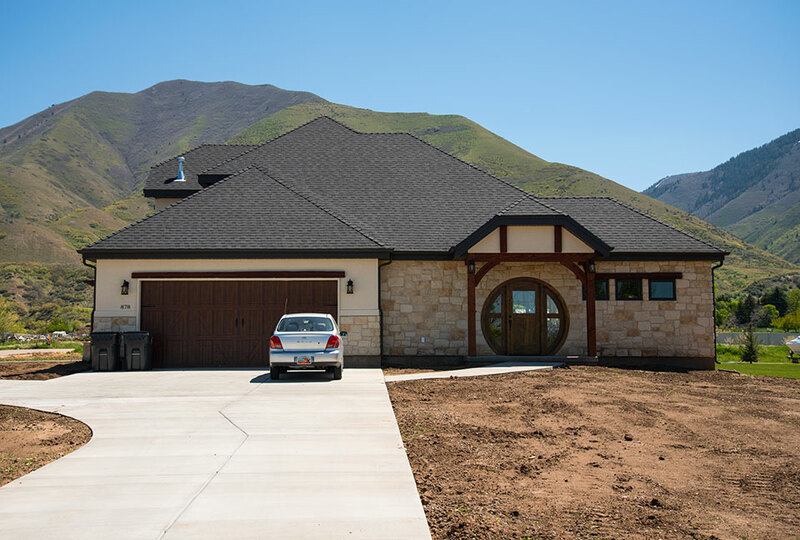 By far the hardest part of building a new home in Mapleton, Utah, was finding the right building lot. Because we wanted to site the building in a particular direction to take advantage of passive solar and provide both a west and a north entry for the house’s two different wings, we needed to find a corner lot on the east side of a street. It took more than a year and a half and several land deals that fell through, but we finally found and purchased our ideal lot. It is at the end of a subdivision on the east side of the street and is situated between two canyons so that winds come from both canyons and can be used to cool the house in the summer. Our architect, Greg Steffensen, designed the home’s placement on the lot to take advantage of the local climate and sun's direction. Some of the passive solar principles he used have been utilized in cultures worldwide for thousands of years, from the siting of ancient buildings such as the Mesa Verde complex in Colorado to traditional Chinese courtyard houses. Others are techniques that have been developed since the energy crisis in the 1970s spurred on-going research into ways to make buildings more energy efficient. The house was placed with its longest side stretching from east to west. Because the sun’s rays hit the sides of buildings at a lower angle in the winter than during the summer, overhangs were placed over south-facing patios such as the one below. The sun hits the house from a higher angle in the summer, its rays bouncing off of the overhang roofs such as the one below rather than entering the windows so that cooling costs are lower during this season. In the winter, when sunshine is welcome in the house, the sun’s lower angle allows more sunshine to get past the overhangs and enter the windows to warm the house on the south side. This structural positioning can be supplemented by shades to accommodate daily and hourly requirements, but so far, the house is so comfortable that we haven’t bothered to install shades except where we need them for privacy reasons. The house is designed to allow us to open windows in the summer and let cooling winds from the nearby canyons circulate through the house. Fans placed at strategic locations help push air coming through open windows on the northeast through the house. The west side, shown below, which gets hot summer sun, has a minimum of windows. Since the energy crisis in the 1970s, there have been many attempts to implement passive solar strategies affordably in homes. The level of complexity and cost for some of these strategies resulted in some ugly architecture with disappointed home owners who found that too many south-facing windows made their homes into ovens in the summer. As a result, getting the residential construction trade and home owners to make decisions based on passive solar has been difficult. This is despite estimates that implementing passive solar construction on a regular basis in residential architecture could save hundreds of millions of dollars on energy and cut down pollution significantly. The above strategies, implemented well, can have a significant effect on a house’s use of energy without negatively impacting the home’s appearance or comfort level. Our house is a traditional-style Mediterranean-French provincial home with a lovely courtyard and patio on the south side around which the living room, kitchen and a flex room are built. It bears no resemblance to some of the passive solar monstrosities that have received bad reviews for their appearance. Our architect also placed the windows in the main bedrooms so that the sun comes up over mountains to the east and lights the rooms naturally in the morning. When choosing a building site and having your home designed, consider the latitude, the sun’s path and the amount of sunshine as well as seasonal variations in solar gain, day and night variations in temperature and prevailing winds. Place room types, internal doors, walls and windows to take advantage of where and when the sun enters the house. Unfortunately, there is no one-size-fits-all passive design for a house, but computer applications that use GPS can help your architect or house designer calculate your design’s passive solar efficiency. 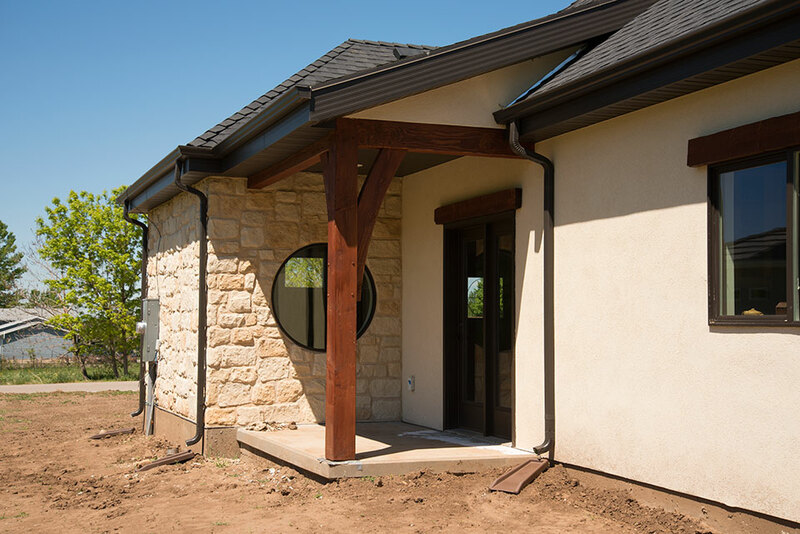 Minimize windows on the west side and use shading elements such as overhangs, trees, pergolas, etc. as needed. Keep in mind that excessive glass areas on the south side can result in overheating in the summer and heat loss when temperatures are low as well as fading soft furnishings and creating glare on computer and other screens. Install a skylight if you love them (we have a small one and a sun tunnel in a bathroom shower), but keep its size down for energy efficiency reasons. When the summer sun is high, it can be nearly perpendicular to a skylight, maximizing a house's solar gain and turning it into a furnace. We experienced this effect in a previous house in which we had two large skylights in an office. Skylights also can be a source of heat loss on cold days. Our small skylight in The Thoughtful House has not been a problem either on warm or cold days. East-facing skylights provide the maximum direct heat and solar heat gain in the morning and west-facing ones do the same in the afternoon, often during the hottest part of the day. Some skylights have glazing that can partially reduce summer solar heat gain while allowing visible light transmission. Skylights and sun tunnels are not considered energy efficient because heat can be lost from them, but they do have the advantage of reducing the need for interior electric lighting during the day. Another passive solar strategy that we implemented was to choose a light colored interior paint. Light colors are more reflective, cutting down on the need for electric lighting during the day, while darker colors absorb sunshine. Passive solar design needs to be combined with other strategies such as insulation and efficient heating appliances. This video shows the process of installing the HVAC system and insulation in The Thoughtful House. Good but conventional insulation can significantly cut down on a home’s energy use and decrease the demand on heating and cooling systems. The amount of insulation your home needs depends on its design, the climate, energy costs in the area, your budget and your personal preference. Building codes specify a minimum standard, which has gradually been raised in most communities as they strive to reduce energy costs. It often is wise to insulate at a higher level than the minimum code requirements if you can afford it. In cold climates, the main aim of insulation is to reduce heat flow out of a building. The components of the building envelope - windows, doors, roofs, walls and air infiltration barriers - are all important sources of heat loss. Losses can be reduced by good weatherization and insulation. In hot climates, the greatest source of heat energy is solar radiation and the major goal is to keep out radiation that overheats the interior of a home. In Utah, where the winters are chilly and the summers can be hot, insulation has to meet both criteria. 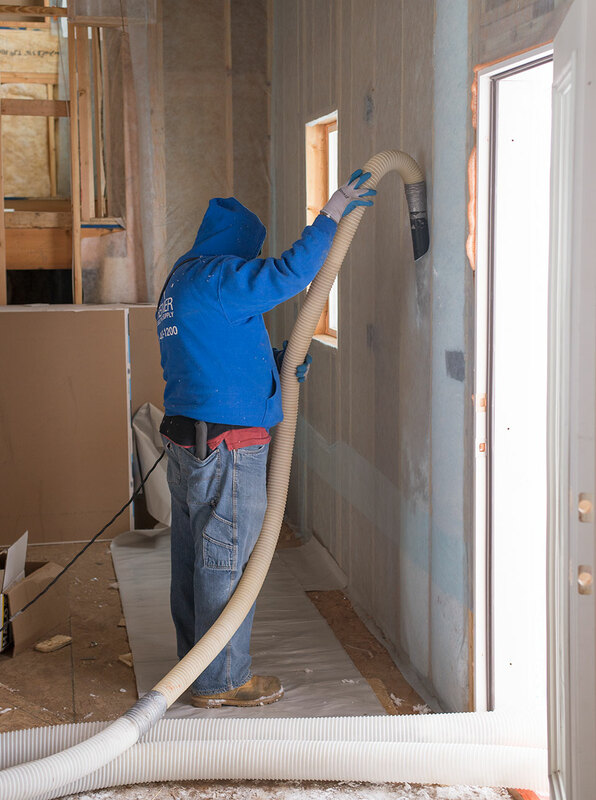 Insulation is an extremely complicated subject that involves not just controlling the air flow in a building, but also the humidity level, which can be associated with the growth of mold and bacteria in walls and can drastically reduce the effectiveness of insulation. A well-built house uses both insulation and air exchange systems such as vents and the way a house is roofed to address these problems. The role of bulk insulation is to block conductive heat transfer into or out of a house. The denser a material is, the better it will conduct heat. Air has low density so it is a good insulator. Insulation that resists conductive heat transfer uses air spaces between fibers and in cavities such as attics. Porous insulations trap air so that significant heat loss is eliminated. The primary role of such insulation is to make the thermal conductivity of the insulation that of trapped, stagnant air. The most common unit of measurement for insulation’s energy efficiency is its R-value, which measures thermal resistance for a particular material or group of materials. The higher the value of R, the better the building insulation's effectiveness, in theory. Since testing the R-value of insulation is usually done at a steady temperature, usually about 70 °F (21 °C) with no surrounding air movement, the listed R-value for insulation will usually be higher than it would be in actual use. The actual R-value of a home also will be dependent on the climate, the building construction and varying heat sources throughout the year. Some insulation may have a high R-value when it is first installed, but it can deteriorate over time, compacting and creating voids to reduce overall performance. This can be avoided or minimized by densely packing the initial installation. However, 20-year tests on some products have shown no shrinkage or reduction in insulating R-values. Among those products is CertainTeed InsulSafe SP, a fiberglass blow-in product used as both thermal and sound absorbing insulation. Premier Insulation and Garage Doors installed this insulation in 2x6 wood frame cavities in the walls of The Thoughtful House. The benefit of InsulSafe SP is that because it is blown in, it makes for tight insulation. It also won’t settle and the company claims that it will last for the life of the home. It is environmentally sustainable, noncombustible, noncorrosive, won’t rot or decay and doesn’t absorb moisture or support fungus growth or vermin. It also is formaldehyde-free. It has a limited lifetime warranty. It is GREENGUARD Gold certified for low emissions into indoor air. The GREENGUARD program requires products to meet strict standards on chemical and particle emissions that can compromise healthy indoor air quality. CertainTeed has been an industry leader in reducing the impact of building products on the environment by developing sustainable products that improve energy efficiency and are long-lasting. The company was the Energy Star Partner of the Year in 2010. Thirty to 35 percent of the materials used to create InsulSafe SP are recycled, higher than the U.S. Environmental Agency’s 20-25 percent recommendation for fiberglass. The company also has incorporated a number of measures at its Chowchilla, California, plant to recycle the water used in production and cut down on the amount of energy required to produce its products by 25-30 percent over the last ten years. The company has introduced new processes to reduce the amount of natural gas needed to produce fiber glass insulation, thus saving energy and reducing carbon dioxide and nitrogen oxide emissions. The plant also operates on a flexible demand system to lower stress on the California electrical grid. The plant recycles more than 95 percent of the waste it generates. CertainTeed is working with ENERGY STAR to try to get its plants certified as models for energy efficient production. CertainTeed is a member of the U.S. Green Building Council. The company also has made its packaging recyclable and ships its insulation in highly compressed packages that have cut down dramatically on the number of trucks needed to transport the product. 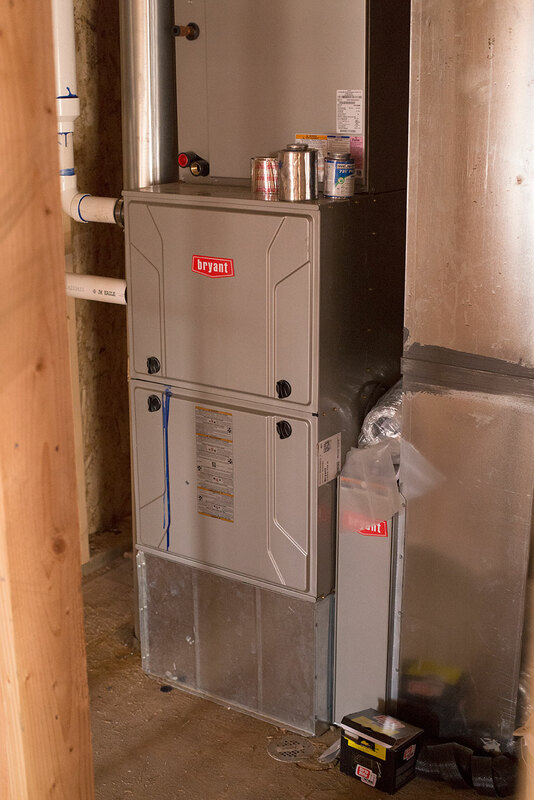 The natural gas furnace in The Thoughtful House is a Bryant 926T, a high efficiency Energy Star model with variable speeds to provide quiet, dependable, even heating and humidity control. Most of the time it operates in an efficient low-stage mode, but also has a higher stage for more extreme winter conditions. The technology adjusts the system operation to changing conditions and humidity. The heat exchanger has a lifetime limited warranty and there is a 10-year parts limited warranty. So far, we are happy with the operation of the unit, which is quiet and extremely comfortable. The Thoughtful House air conditioner is a two-state Bryant with Puron refrigerant, model 127A. The air conditioner has up to 17 SEER and up to 13.5 EER efficiency. SEER stands for Seasonal Energy Efficiency Ratio (SEER) as defined by the Air Conditioning, Heating, and Refrigeration Institute. The SEER rating of a unit is the cooling output during a typical cooling-season divided by the total electric energy input during the same period. The higher the unit's SEER rating the more energy efficient it is. EER is the Energy Efficiency Ratio, or ratio of output cooling energy in BTU to input electrical energy. ENERGY STAR qualified central air conditioners must have a SEER of at least 14.5. Higher SEER ratings can result in hundreds of dollars a year in electric energy savings. 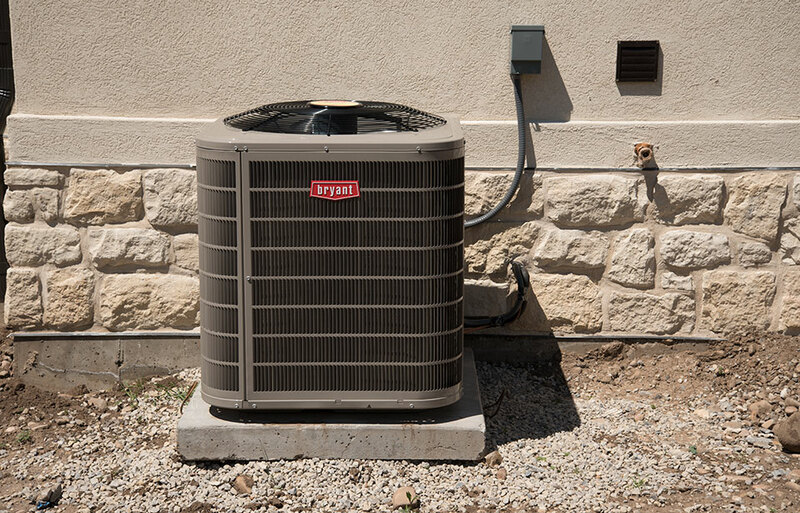 Our air conditioner's two-stage operation allows for longer and more consistent comfort on low stage, which helps save on energy and provides better indoor air quality. The air conditioner meets Energy Star guidelines for high efficiency. The house has four zones, and we have Nest thermostats so we can control the temperature in various zones in the house from our iPhones. This has been very useful, because we can remotely turn down the temperature in various parts of the house when they are unoccupied. These energy efficient measures are nowhere near giving us a zero energy home. To achieve that, we would have had to spend a great deal more money and would have gone outside our main goal of creating an energy efficient home that was within the cost per square footage of a middle class home. However, our energy utility bills in The Thoughtful House so far are about half the cost per square footage that they were in the last house we owned in North Carolina, and are a little over half the energy bills for a similar-sized house in Mapleton, Utah, that we considered buying about a year ago. Our utility bills are about the same as those we paid recently while staying in a rented house in nearby Provo, Utah, that was less than a third the square footage of The Thoughtful House. We are continuing to track the cost as winter heating subsides and summer cooling kicks in, so stay tuned. The house is extremely quiet, comfortable, and peaceful feeling and the interior air is very clean. An added advantage of the insulation is that several rooms in the house have amazing acoustics. In the living room, a movie played on an iPad Pro with its built-in speakers sounds like it is being shown in a theater. 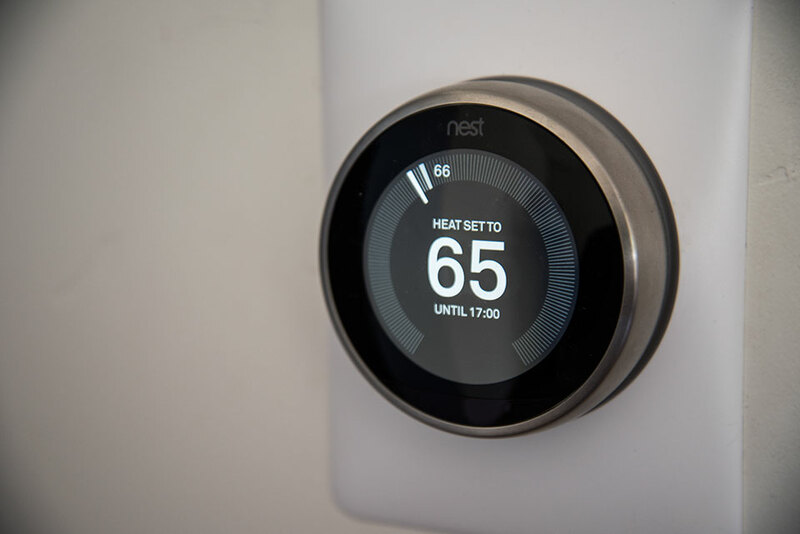 An added bonus of energy efficient choices is that rebates are available for some energy efficient features, although we have found the rebate systems difficult to negotiate. In some cases, rebates are not available for new homes but only for renovations. In others, the builder has to apply for rebates rather than the home owner. Future blogs will explore other energy saving and healthy strategies – lighting choices, other appliances, landscaping options and environmentally friendly interior paint.